I hope you have all been busy creating wonderful art works for the Annual Exhibition which is just around the corner. Entry forms need to be in by the next meeting on Thursday 6th October or sent to Val. We will have flyers at the meeting for you to distribute, as well as invitations for the opening on Friday night. As most of you know, the Art Trail has just finished, this year being the second year running. 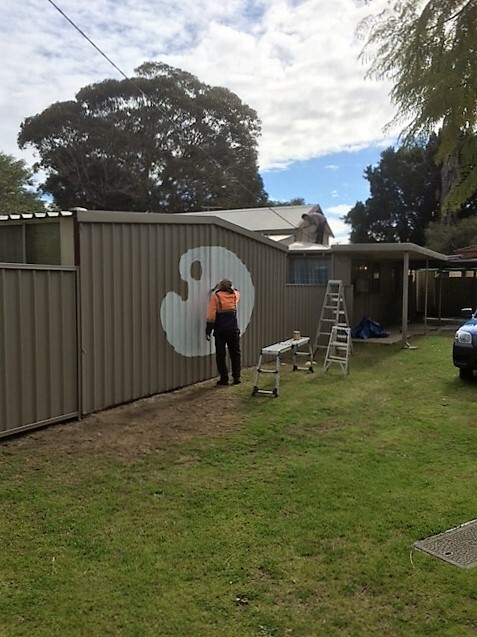 It was unfortunate that the weather was a bit cool, but from the comments from the members participating, everyone enjoyed each others company whilst painting and chit chatting together. A huge thank you to Dot and those who helped organize it. There was very positive feedback from the public about the Art House which is wonderful for the Society. Please bring in your catalogue covers to the meeting or the Art House over the next few weeks, so we can assemble them for the Exhibition. We are also collecting donations for our Christmas Raffle, which can also be bought to the meeting or left at the Art House. Our end of year Christmas Raffle is always very popular and is a great fundraiser, so your donations are very much appreciated. Once again, see you at the next meeting 6th October. Creyk Park Pavilion, Waltham Rd, Armadale . Pamela was born in Western Australia, educated at Penros College and gained her art degree in Perth. She has supplied works for an interior decorator and has works hanging in restaurants around perth plus galleries, Wineries and many private homes. Her works have gone to many countries around the world. she joined international artists for four exhibitions at Allendale Square and the Burswood Hotel. Pamela also does commission work and holds private tuition. Canvases for sale at the art house at very reasonable prices, wide selection of sizes, good quality. THANKS TO IAN KALLAS, ANNA NEWBEY AND JON COPE. Will be demonstrating and selling their works over the weekend. Also Devonshire teas, sausage sizzle, soups and lots of other home made goodies for sale. Since finishing the painting and artwork on the front of the art house we have had many visitors just call in to see what we do, and we have even had a few art sales as a result. You should call in and see, there are large paint brushes and palette, even the post box has had an imaginative face lift, leaves no doubt as to what we do there !!!! Peta and Linda braved the elements to paint and draw outside under the gazebos, that is real dedication to art !! And the sales desk was kept nice and busy !!! "Watercolour - finding the light" with Megan O'Brien: a series of 6 watercolour classes suitable for beginners/intermediates. We will explore these fundamental skills and apply what we discover to create unique artworks. 9 a.m. - 12 noon. $15.00 per session. FRIDAY PM DRAWING CLASS pm Chantelle 0422541738. SATURDAY Alt Saturdays, am NEW A Saturday morning where painters can come and bring projects and get each others advice. Critiqueing, technical support and hanging out painting. Any painting medium. From 10 till 12 for $3 bring your own stuff. GO TO OUR WEBSITE FOR MORE INFORMATION ON WORKSHOPS, CLASSES AND GROUPS. Come and join us with the Judith & Carol from H.U. Kendall & Co to see the wonderful NEW product Ampersand Boards. We will demonstrate how the products can be used with all mediums eg. Oils, Acrylics, Watercolours, Pastels, Charcoal, Inks and much more. Spread the word and bring your friends to see this exciting product. Call in and see the resident artists and feature artist of the month. Sit around the table and have a cuppa and a chat. raffle at the meeting and have great fun and raise a little towards funds. The collection point is at the art house in the library area. Please be generous, preferably Christmas fare, and check the use by date we have to dispose of anything that is past the date. the cost is $50 per bed , dinner cost is $15 per night if you want that, its up to you , we had beautiful dinners last time suppled from the Blue Wren cafe. total cost for 5 nights with dinner $325, minus dinner $250. This has proved to be a very popular idea, an ideal opportunity to have your very own mini exhibition completely free. BUT WAIT THIS ONE IS FULL AS WELL BUT SHE WILL TAKE NAMES IN CASE SOMEONE CANT MAKE IT. See our previous newsletter for all the information or ring Leesa for details. These have been professionally designed and printed, you will find some with this newsletter for you to distribute, please make sure you do this please, more will be available at the meeting and from the art house. This is a very successful way of promoting this event, a lot of time and effort has been put into producing these flyers so make the most of them. Make sure you put your name down for roster duties over the weekend. We will once again be doing Devonshire teas so will need a few people to serve. Please make sure your paintings are picked up from hall on Sunday from 4 pm OR arrange with a friend to pick up. Small paintings for the Annual Exhibition Catalogues. HANDED IN BUT WE STILL NEED MORE, Thank you to all of you who have brought yours in. Watercolour paper is available, cut to the correct size, at the next meeting also at the Art House in the shed. When painting after a break or if you are feeling a bit unhappy with your work then forget all the challenging subjects and mediums, just pick your most favourite subject, one that you can do with your eyes shut. Paint what you love and you will love what you have painted and it’s a great feeling to finish a satisfying piece of work. Don’t make it a large mammoth effort, just do something that you will be pleased with when finished. The first day of the open studio trail, great fun setting up. We have had a few visitors already and some very possitive comments. Come and visit, watch our artists at work and join us for a cuppa. Here are a few photos. The Art House is looking wonderful with some great artwork on display and for sale. The exhibit is on at the Kelmscott Stargate Shopping Center, Albany Hwy., Kelmscott until Saturday 3rd September. Paintings are all from students at Carol Joys' portrait class at the Armadale Society of Artists, Art House. I dont know where that month went, but we are here again with another newsletter.Soon it will be Christmas!) Please find enclosed the entry forms for our Annual Art Exhibition, due at the October meeting or before. As most of you are aware now, we received a wonderful grant from the City of Armadale so the exhibition will have some lovely additions including music, catering and an MC, as well as involving a few community groups to help and enjoy the Exhibition. We are now also asking for donations for our Christmas raffle. These can be left at the Art House in the kitchen or bought to the meetings. Also donations of paintings for the raffle at the Exhibition. These can also be left at the Art House. The Art Trail is also starting on the 8th September and we have 21 of our members involved at the Art House as well as members who have their own studios showing their work and creative working areas. For those who are not involved, please support these members, its a lovely way to enjoy the weekend. Lastly, I would like to say a huge thank you to those who volunteered for the Outside The Frame Exhibition, especially to Christine England who did countless rosters. We are paid very well by the City of Armadale to man this event and is an easy fundraiser that everyone can participate in. Once again, I hope to see you at the next Meeting which is on the 1st of September. 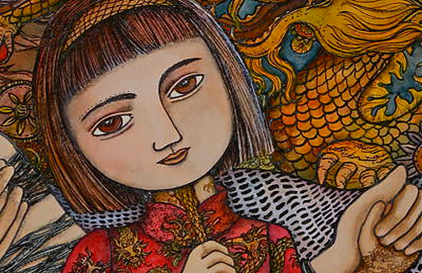 “The essence of my artwork lies in metaphor with imagery depicting stories and memories of my childhood. These stories are layered with mythology and dreams. Stories told to me as a child growing up in a multi-cultural environment of mixed nationalities, religious beliefs and cultural traditions. I love to work in a range of mixed media including textiles, paint mediums and found objects. My use of pattern, creating rich textures and colour is influenced by the beauty of my mother's embroidery. These patterns are often intergrated into my paintings as symbols connecting us in my own art practice. Inspiration for my works comes from nature, my journey as a woman, a mother and the magic of people constantly flowing into my life. Logan model 303, 70 cm long rule Matt cutter, with lots of unopened spare blades ,with value of over $30 . As new cond. $100 the lot ,ono. WE HAVE HAD A FEW BEAUTIFUL SMALL MASTERPIECES HANDED IN BUT WE STILL NEED MORE, Thank you to all of you who have brought yours in. outside the frame Art wards . A big thank you must be extended to Maureen Smith who has worked tirelessly to organise the roster, not an easy task, but as ever she has done a marvellous job, also has done a lot of the duty herself, also big thanks to everyone who helped, some of them did more than their fair share. It was a wonderful display of work from incredibly talented high school students. Welcome to a fascinating world of creative discovery on the Armadale Hills Open Studio Art Trail. Our local artists are opening up their private studios to the public for an intimate view of their inspiring creative processes. On the arts trail you will discover an extraordinary array of beautiful paintings, watercolours, pastels, textiles, couture, ceramics and stoneware, steel sculptures, fine wood turning, Bibbullmum art, photography and brilliant bear making. Our artists look forward to your patronage and we wish you a happy trail through our much-loved Armadale arts community. DISPLAYING THEIR WORK AND DEMONSTRATING. THERE WILL ALSO BE SOME HANDS ON ACTIVITIES FOR ADULTS AND CHILDREN. Also our resident artists, Jane Etienne, David Box, Sandy Robertson, Christine England. Invitation: from Trish Halleran 2nd Thursday 15 September during the Armadale Hills Open Studio, the Perth Plein Air Painters will be having their usual weekly Paint Out at 6 Notting Hill Drive, Roleystone starting 9.30 to 12.30pm. If any ASA Plein Air Painters would like to join in they would be welcome. We would need an RSVP as a BBQ lunch will be provided, vegetarians byo. Ring Trish 0417 042901. Chantalle will no longer be teaching alternate Saturdays but would like to run an informal painting (or drawing) group for anyone who would like to come along, you can ring Chantalle on 0422541738. for more information or just turn up, the first group will start on 1st October as the Art Studio Trail will be on for the weekends in middle of September. Chantalle will still be having a class on Saturday 3rd September but that will be the last one. She is still running her drawing classes on the Fridays as usual. Or you may know an artist who may be interested, perhaps not at present a member of the society, or one of our very talented members who’s work you like and would like to learn their techniques, why not ask them to do a workshop at the Art House. Don’t make the common mistake of using too little paint and too much water. If you are blending this works a lot better if you are not too mean with the paint, use a medium like a flow medium or clear painting medium and just enough water to damp your brush. If you forget to clean your brush at the end of your session and the paint dries on the brush, soak it in Windex then rinse thoroughly, it should bring it back to almost new, you can also use Windex on clothes so long as the paint isn’t days old. We are now collecting goodies for the Christmas hampers, raffled off at our December meeting, we usually have at least 10 hampers to raffle at the meeting and have great fun and raise a little towards funds. The collection point is at the art house in the library area. Please be generous, preferably Christmas fare, and check the use by date we have to dispose of anything that is past the date. We would like at least 6 good paintings to be donated for the Annual Exhibition Raffles, we remind you that you are not charged commission on any sales so we need to raise funds toward the cost of putting on this event for you. Its also a very good way to show your work as people usually ask to see more of the donating artists work. The Gallery will be taken down on Tuesday 6th September ready for the Art Studio Trail, so please collect any you have displayed there before that date, any that are left will be carefully stored. We will rehang the gallery after the Art Studio Trail has finished, probably on Thursday 22nd September (tbc) so deliver your paintings you would like displayed after Monday 19th Sept and before 22nd Sept please. And of course when there are groups and classes Call in and see the resident artists and feature artist of the month. Sit around the table and have a cuppa and a chat. The Warehouse Gallery is now seeking expressions of interest for its October 2016 exhibition. The Warehouse Gallery is a community art project and is an inclusive gallery space. The Warehouse Gallery seeks to support and provide opportunities for people experiencing social or economic disadvantage to develop their arts practice, learn new skills and facilitate social inclusion. Artists are invited to submit one or several pieces to exhibit. Pieces will be offered for sale with proceeds going back to the artist. The exhibition runs from 21 October to 18 November 2016. Yes it’s the long awaited Leesa Padget workshop. Details as follows, it promises to be a wonderful day as usual and a lot of fun and laughs. Join me as we make our own little (or large!) 'Compendium of Secrets'. Together we will make a Mixed Media 'recipe book'. We will do a hardcover/hardpage board book with a selection of recipes and ideas for textures (I will let you in on some of my favs). The book will be made up of experiments in hard surfaces and also on different papers. We'll experiment with colour, stencils and texture... we'll make rusty patinas and creative collages. We will also try some surfaces that you might never have used before. At the end of the workshop we'll bind our books into our own 'Compendium of Secrets' that you will have to refer back to (or just enjoy looking at) for years to come. The cost is $55 per scientist, most materials supplied (a full list of supplies will be emailed on booking) If Leesa is booked up for this date she may do another so don’t put it off ring her now. It was decided to repaint the outside of the art house as it hadn’t had a facelift for many years, so no sooner was it decided, it was done, here is a picture of Alan and Anna Newbey busy painting. It now looks marvellous painted a very tasteful but trendy colour with a big palette on the wall of the shed which stands out for all to see that we are all about ART !!! 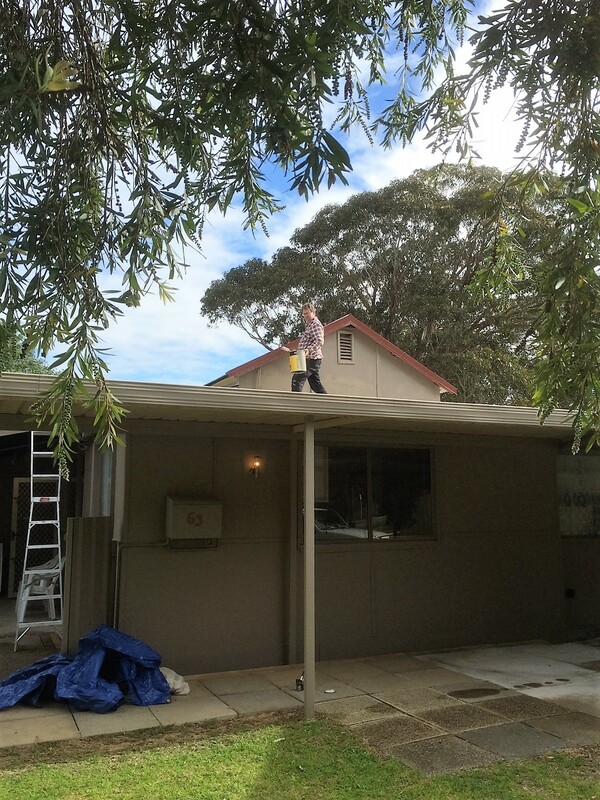 Alan did a bit more work on the front above the car port while Eddie an Sandy finished off the Palette. The seating area outside the shed has also been painted and 4 big murals are in the process of being created to brighten up the seating area. These are being painted by Geoff Reeves, Jane Etienne, Dot Marshall and Eddie Beer. Also thanks to David, Jane and Dot we now have a coloured pencil gate!! Thanks to everyone involved, our Art House is now even more magnificent. Please come and have a look. 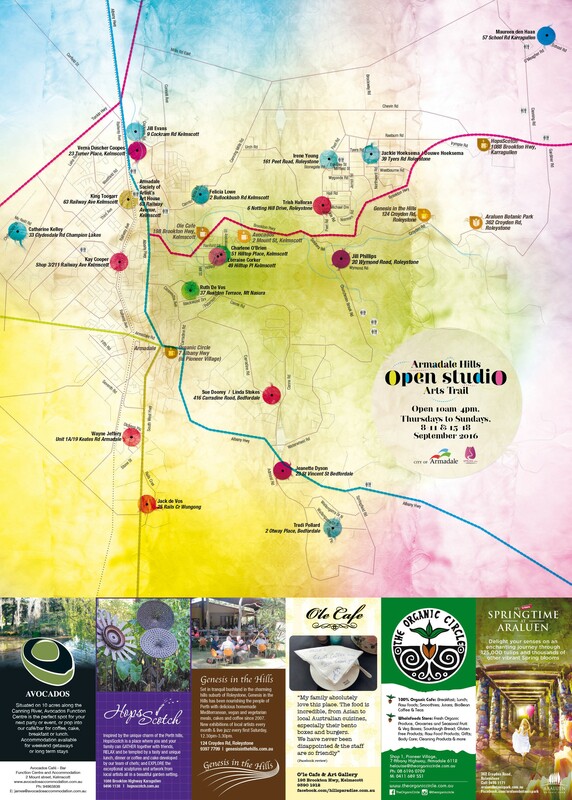 The long awaited Armadale Hills Open Studios Art Trail 2016 is coming very soon, 8th 9th 10th 11th September then the following weekend of 15th 16th 17th 18th with all these studios taking part. 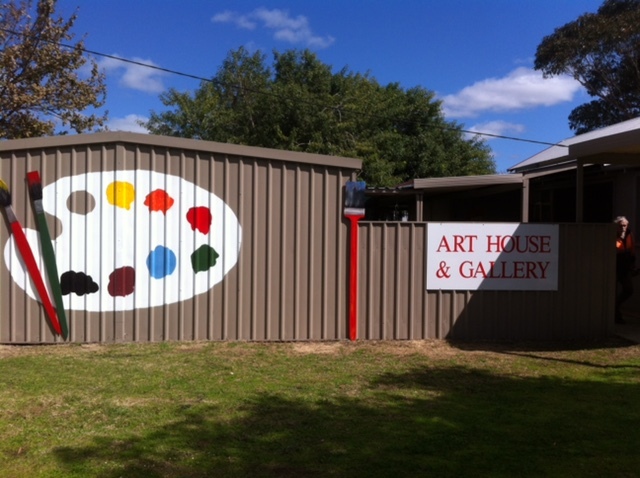 The art House and Gallery, 63 Railway Ave., Kelmscott is currently having a facelift, and with 20 of our very own artists taking part in this trail at the Art House it promises to be one of the biggest art events this district has seen. The following information and map will help you plan your weekends to enjoy travelling through the hills of Armadale and talking to the artists. The Art House and Gallery has had extensive alterations lately and a new area has been created for the Feature Artist of the month. it is now in the entrance to the Gallery and looks great. This month's feature artist is Dot Marshall, here are some photos of her display, call in and have a cuppa and a chat, and look around the gallery. Dot will be there from Wednesday to Saturday 10am to 3pm each week for the month of August. 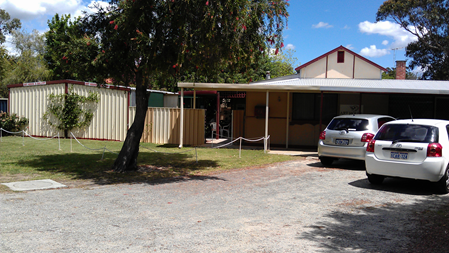 Look forward to seeing you there 63 Railway Ave., Kelmscott. there is a new artist on our website http://armadalesocietyofartists.com.au/our-artists/sandra-spindler go and look at her lovely paintings. Most of you will know Sandy of course, she has been doing a fantastic job organising our monthly demonstrators. Also new work from Val Mezger http://armadalesocietyofartists.com.au/our-artists/valerie-mezger val has been our treasurer for almost 9 years and been an invaluable member of the committee for much longer than that. Val also teaches oil painting at the Art House on Wednesday afternoons. I hope you are busy creating some beautiful works for the Annual Exhibition which is creeping up very quickly. We hope this year will be as successful as last year with many new members joining and a wide variety of mediums used. We are now approaching our wonderful sponsors for their help and support. If there is anyone you can think of that may wish to sponsor this wonderful event, please contact our secretary Helen Gordon for details. Our sponsors are very well advertised and as you know we have many people come through to visit the Exhibition over the weekend. The Art Trail will also be upon us soon, details from Dot are in the newsletter. This is the second year it has been on, sponsored by the City of Armadale. I understand there is approximately 20 local Armadale studios taking part. If you haven't joined yet, please think about it, its great fun and a good excuse to get your paint brushes out. Closing date is 29th July, so be quick. Contact Dot for details. We had a great response to people wishing to receive their newsletter by email, I think its a great idea that there is the option of email or post. Many have also opted to collect theirs from Art House, which hopefully will generate more members visiting and seeing the wonderful display by our very creative members. Hope to see you at the next meeting Thursday 4th August, hopefully it wont be so cold! Our own award winning artist Leesa Padget will be demonstrating her own inimitable style of painting birds. Leesa works with all medias, and this time will be working mixed media. You can see her blog at leesapadget.blogspot.com.au well worth a visit. She runs classes and workshops, and has run a few workshops at the Art House which are always popular, be quick to put your name down for the next one, its always fun. She hasn’t set a date yet so watch out on our latest news page on our website and in the next newsletter. Leesa has won many awards, too numerous to mention here and her work is in collections around the world..
Catalogue cover painting at the new casual group on Friday morning at the Art House. Always a bit of a challenge to do small paintings and a lot of fun, its also a very good way to promote your work at the Annual Exhibition, people that pick up a catalogue usually ask to see the artist’s work. So always sign your little masterpieces. With watercolour you paint from light to dark, leaving the white of the paper as your lightest lights. Therefore you need to have an idea in advance where those areas will be so you can paint around them. You can carefully avoid them, or you can paint a masking fluid over these areas to protect them. The masking fluid dries into a rubbery material that you can easily rub off with your finger. You can also use an artist tape or painter's tape to mask out areas you want to leave white. Watercolour paper is available, cut to the correct size, at the Art House in the shed. catalogue covers if you would like to join in and have some fun. EXHIBITION AND A GREAT WAY TO ADVERTISE YOUR ARTWORK. ROSTER FOR OUTSIDE THE FRAME ART AWARDS . WE are well rewarded by the City of Armadale for manning this exhibition, its also a very good way to promote the club and yourself. The Art Trail is creeping up quickly and I'm sure will be as successful as last year. Dont forget to get your "expressions of interest" form in by the end of July. You still have time to get yours in, if you want to be involved. It will be a great way to mix with other members from the Art Society as well as show off your artwork and skills to the public. The City of Armadale promote it very well so it should be great. founder member and very talented artist. Helen turns 100 on the 10th August. Helen has been a very active member of our society since its inception taking part in every exhibition and being involved on the committee. She is mum to Helen Cockburn who most of you will know well. Have a wonderful day Helen, safe to say that you are definitely the oldest member of our society, we will be thinking of you, have a lovely day with your friends and family. Thanks for helping to establish this wonderful art society. A huge thank you to Claire Botman from Zetatech for continually updating and managing our website. The website looks wonderful and creates a lot of interest and enquires. Thank you to Dot for working with Claire, especially lately whilst making the site more user friendly for the newsletter. Important ——- you don’t need to have a computer to be part of the website. We are getting lots of visitors now and regularly make good sales from the Gallery. Well worth hanging your work. We have too many books on the trading table at the Art House so we have decided to give our members first choice, any that are left will be taken to the op shop. The trading table is situated in the far end of the kitchen area……...please note our library books are definitely NOT included in this offer. Thank you to Jenny Jacobson for pruning the roses, they are going to look wonderful again, roses are so giving, and we are lucky to have some that have beautiful perfume. Many members have painted them, I saw a gorgeous painting from Val of one one of the red roses. Thank you to everyone who has been donating plants to the Art House. All money goes to the Art Society. If anyone has any plants they would like to donate, please bring them down. Everyone loves them and the time is quickly coming up when we are thinking of gardening for the spring. Ahh Spring, what a lovely time of year for the garden, cant wait. SATURDAY Alt Saturdays, am Acrylic and mixed media classes with Chantalle Grummet, 0422 541 738. I know this was in last month’s newsletter but I’m running the same workshop again as a few people couldn't make that date and asked me to run another. So if you want to come please contact me, plenty of spaces available at the moment. We had lots of fun last time, a full on day with lots of information. For all members of the Art Society we would like to extend an invitaion to take part in this prestigious event at the Art House to be held in September. Please click Download to download the expression of interest form. Contact Dot at [email protected] if you have any questions.